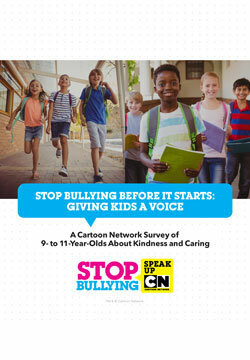 We loved working with Cartoon Network and the Making Caring Common project at Harvard University on this nationally-representative, probability-based survey of 9- to 11-year-olds. The survey documents the number of kids that have witnessed or experienced bullying, as well as how many have tried to help someone who has been bullied. But more than that, it also documents the fact that lots of kids are reaching out in brave acts of kindness to kids who are different from them – kids who are being left out, picked on, or just having a tough time or feeling down. The survey also shows that kids aren’t getting the leadership from adults that they deserve: a majority say the adults in our government don’t set a good example of treating people kindly, and 70% said it would help kids their age be nicer to one another if our country’s leaders set a better example. See the infographic for more information, and check out the NPR Ed blog here.